Let’s be honest, wen you think about the holidays what do you think of? Maybe it’s time with your family, possibly it’s all the lights, or it could be all the presents that still have to be bought. One thing that everyone thinks about at the holidays is sweets. It’s just not Christmas without holiday sweets. 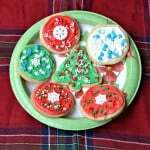 While I love Christmas cookies and I usually make 30-40 dozen each year, after a while I just can’t eat another one. That’s why I like to keep Marie Callender’s® Dessert Pies on hand. 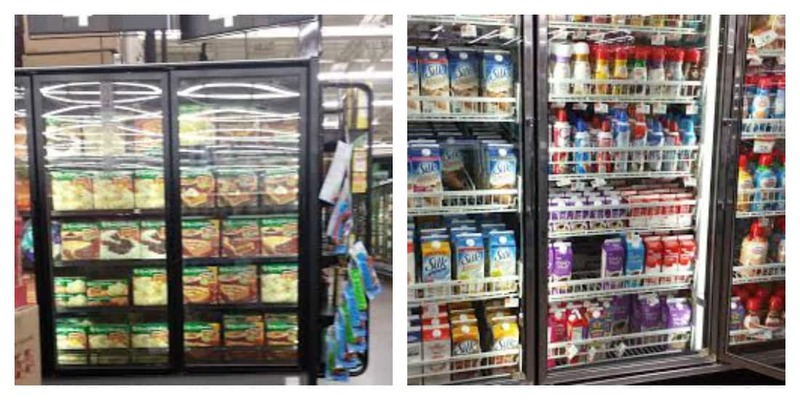 I’ve found that Walmart has a variety of flavors that are readily available anytime. Not only do I not have to make the pie, but these awesome pies taste homemade and all I have to do is bake them in the oven! 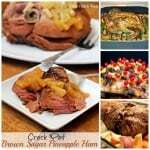 With so many flavors to choose from, it’s easy to buy two and keep them in freezer for sharing with friends and family when they come to visit. However, friends and family can’t always come to visit during the holidays. You know how it is, everyone is busy with their own families, holiday activities, and buying presents. 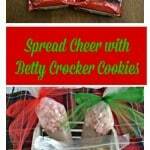 Sometimes it’s fun to surprise a friend with a holiday treat that the entire family can enjoy. That’s why I’ve come up with an awesome way to share the joy of pie with a few of my closest friends this holiday season. While I think it would be awesome to drop off a pie on a friends doorstep and hope they find it soon after it’s delivered, I’ve found a more practical way to deliver this sweet treat at the holidays. I’ve found that putting the pie into a mason jar and layering it with nuts and Reddi-wip® is a great way to deliver it to friends and family. It’s easy to transport, it looks pretty, and I can decorate the mason jars for the holidays. For Christmas I like to layer Marie Callender’s® Cherry Crunch Pie, Reddi-wip® , and pistachios to give it a fun and festive red and green look. 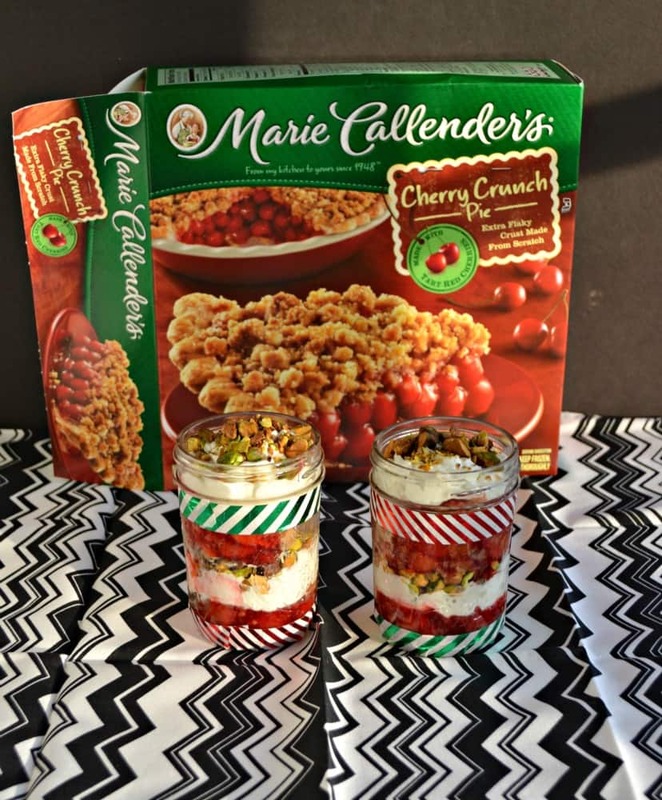 I like to put them in half pint mason jars because I can make between 8-10 of these fun parfaits out of one Marie Callender’s® Cherry Crunch Pie. 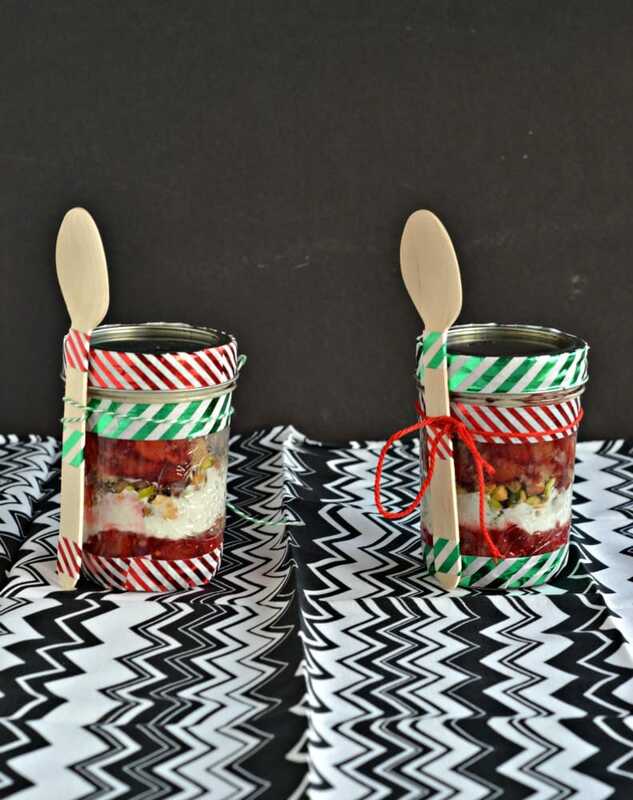 A great way to deliver them is in decorated mason jars along with matching wooden spoons. I always have mason jars in the basement because I like to can and I recently bought the wooden spoons online. It’s so easy and fun to make these matching with washi tape. 1. Take the lids off of the mason jars. Wrap red tape around the outer edge of 4 of the mason jar lids and wrap the green tape around the outer edge of the remaining 4 mason jar lids. Set aside. 2. Take four of the jars. Wrap the green washi tape around the top of the jar, just below the seam where the lid screws on. Wrap the red washi tape around the bottom edge of the jars. Set aside. 3. Take the remianing four jars. Wrap the red washi tape around the top of the jar, just below the seam where the lid screws on. Wrap the green washi tape around the bottom edge of the jars. Set aside. 4. Take four of the wooden teaspoons. Wrap a small strip of red washi tape just below the round part of the spoon and another small strip of red washi tape at the bottom of the handle. Wrap a piece of green washi tape in the middle. 5. Take the remaining four wooden teaspoons. Wrap a small strip of green washi tape just below the round part of the spoon and another small strip of green washi tape at the bottom of the handle. Wrap a piece of red washi tape in the middle. 6. 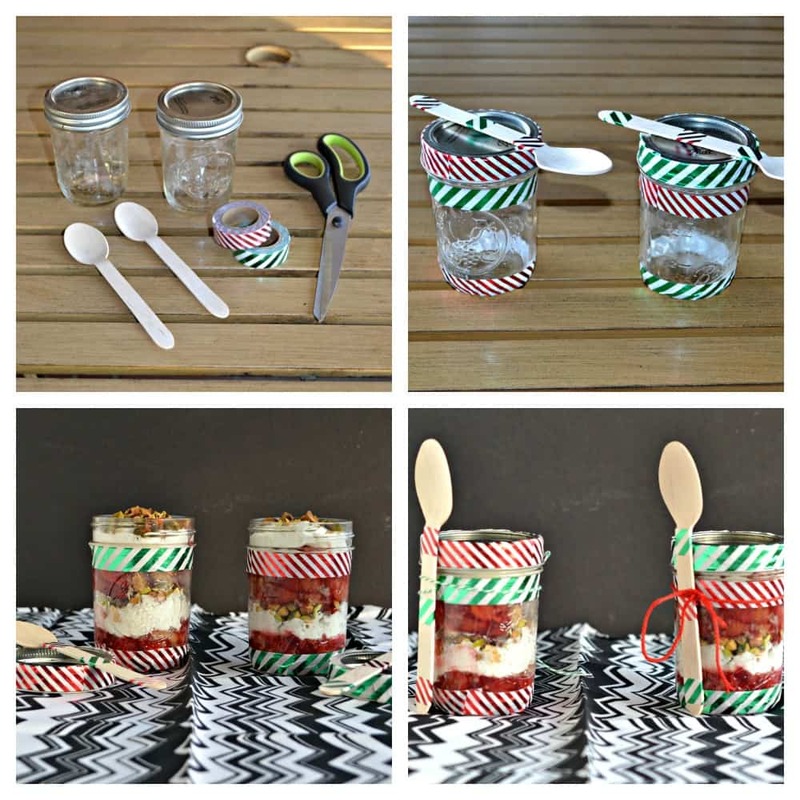 Match the spoons to the mason jars. Spoons that have red at the bottom of the handles match with the jars that have red at the bottom. Using a piece of kitchen twine, tie the spoon onto the jar. 7. 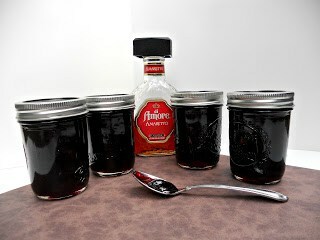 Fill the jars with the cherry pie parfaits, screw on the lid (lid color will match the color that’s on the bottom of the jar), and take to your friends house. After making the jars simply bake the cherry crunch pie in the oven. While it is baking chop the pistachios to get them ready to layer in the jars. 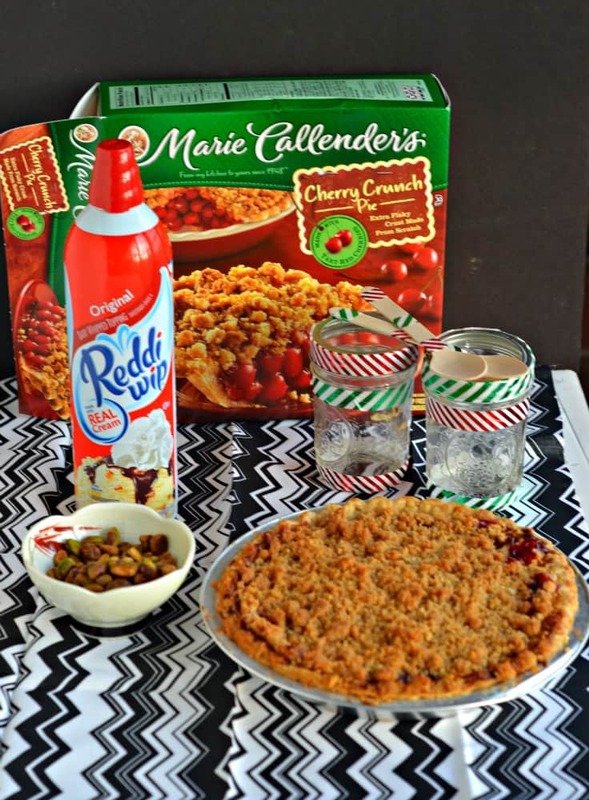 Once the pie has cooled layer the Marie Callender’s® Cherry Crunch Pie, Reddi-wip® , and pistachios in the jar. Make sure to end with the Reddi-wip® and then the pistachios. Screw on the lids and deliver to friends and family to share the joy of pie this holiday season! 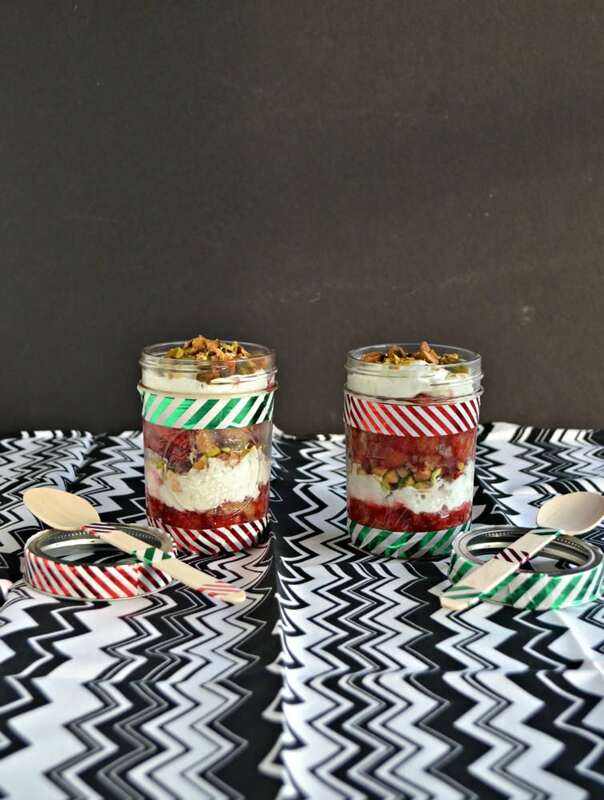 Enjoy a fun and festive holiday treat with these Cherry Pie Parfaits with Reddi-wip® and pistachios. Bake the pie according to the package directions. Remove from the oven and cool completely. Open 8 half pint mason jars. Place two spoonfuls of pie in the jars. Spray 1 tablespoon of Reddi-wip® on top of the pie and sprinkle with 1 tablespoon of pistachios on top. Repeat two more times or until the jars are full. Screw on the lids and deliver to friends and family! Nothing better for the holidays, everyone loves a fun desert. Great idea! I love how festive they look too. These would be great to take to a pot luck.